The 17th-largest city in United States, Fort Worth is comprised of seven primary entertainment districts, offering everything from a wide array of dining, shopping, and cultural amenities. Fort Worth draws in a staggering 6.5 million visitors annually, and boasts the amenities of a big city while still feeling manageable like that of a medium sized destination. This results in a truly stellar experience for tourists and visitors alike. 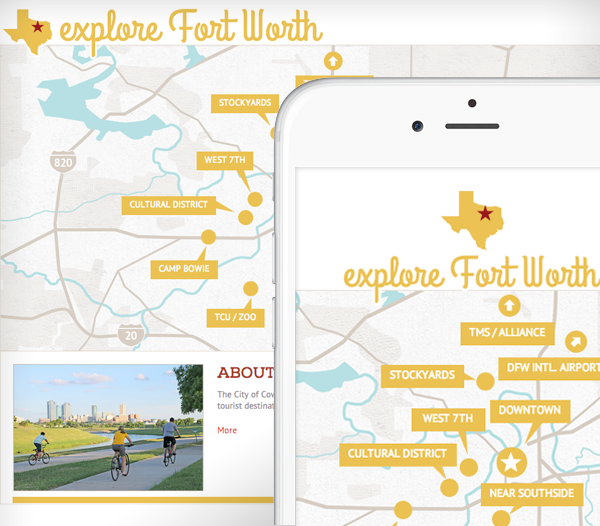 Quick to keep up with the latest website trends, Fort Worth recently redesigned their website. 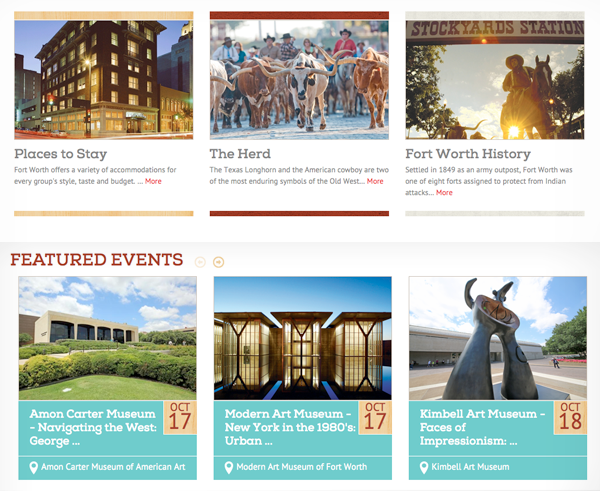 The new fortworth.com is a sophisticated yet simple design that is easily navigable with some truly standout homepage features. Adding a new layer of interaction to the homepage, the "explore Fort Worth" map allows users to learn more about each of the seven primary districts in Fort Worth. The interactive map also pinpoints locations such as downtown and the DFW International Airport. 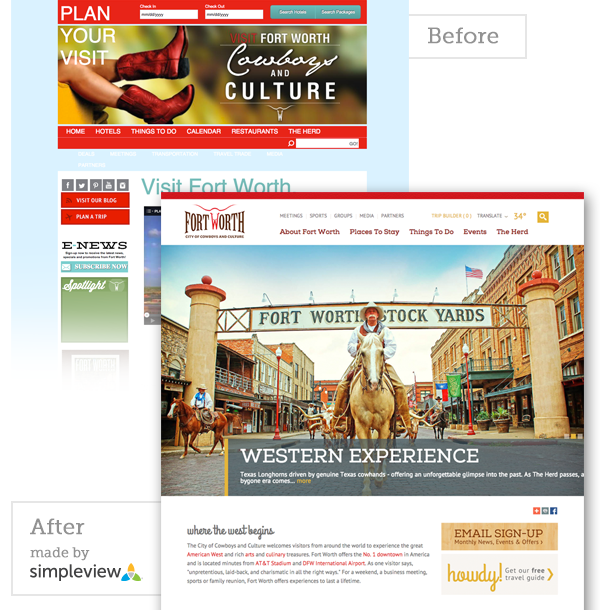 Fort Worth features numerous styles and layouts that expertly complement their site. Image boxes and featured events both have their own, eye catching colors, while the listings page presents a multitude of meeting facilities and events information. 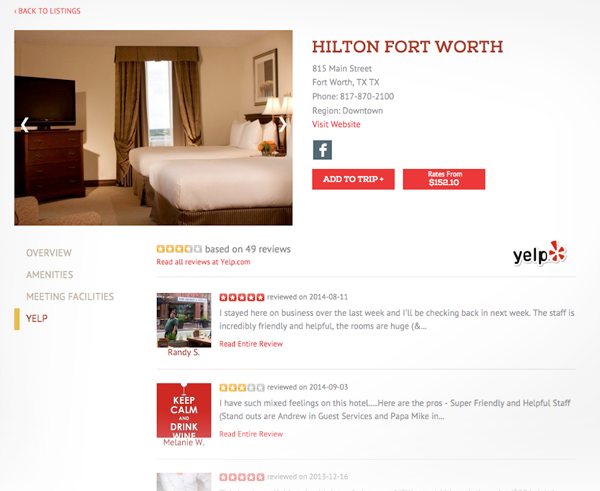 Speaking of listings, one of the most popular new features is Fort Worth&apos;s new Yelp integration. This feature quickly populates reviews from people and visitors just like you, and integrates beautifully with the listings page. These are just a few of Fort Worth&apos;s new features, but there are plenty more to check out! To see all them up close, visit fortworth.com. 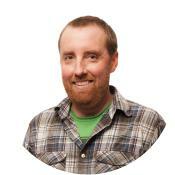 Luke Johnson is a CMS Project Manager for Simpleview since 2008. By welcoming all departments to utilize their skills in the most advantageous way possible, Luke ensures projects are completed efficiently and on-schedule. His favorite aspect of project management is the reward of a website going live after months of hard work and preparation.